The Panasonic Leica DG Summilux 12mm f/1.4 ASPH is a wide angle Micro 4/3 lens with exceptional sharpness and low light performance. Both stills and video are fantastic on this lens. As part of the partnership between Panasonic and Leica, this is the 6th lens in the series and one of my personal favorites. Wide angle lenses are a challenge with Micro 4/3 systems. The focal length equivalents are all half of what you’d use on a full frame system. In the case of this lens, you are using a 12mm to achieve a 24mm angle of view in full frame terms. But it is a 12 mm lens and in reality terms (not equivalent) 12mm is extremely wide. But Panasonic and Leica have designed a lens that plays turns weaknesses into strengths. This is what makes this lens so unique. Depth-of-field gets wide quickly as you move away from the lens so you can get things extremely sharp at really wide apertures, at just a few feet away. The sweet spot on this lens is around f/2.8 so this makes a great lens for low light pictures. You can get great separation for portraits, this lens has beautiful bokeh. But you’re going to need to get very close on your subject to see the effect. Lens distortion is corrected optically and also in-camera software correction (this is fairly standard for Micro 4/3 and even APS-C camera systems). There is some distortion, but its quite usable. 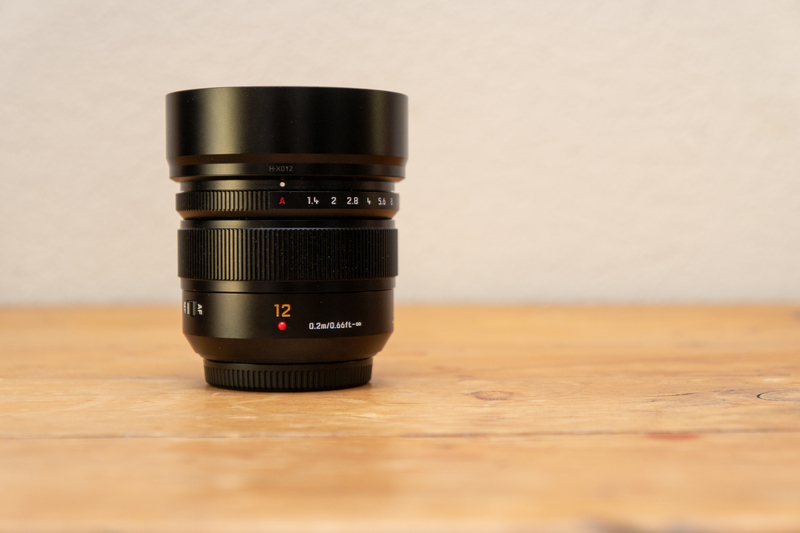 This makes the Summilux 12mm f/1.4 an excellent lens for vlogging or selfies. In fact, if you record yourself for video – this lens is absolutely essential. There is a lot of glass in this lens, but it works. Its been heavily engineered to the Micro 4/3 system and normally I would be skeptical of this many elements in a prime lens. The results are in the images though and this is one of my favorite lenses ever made. I’m fairly confident that the intent of this lens was to design something that would stay sharp in low light. Optical performance is exceptional. Images are sharp with exceptional contrast. Color rendition is beautiful as well. You can see this in the sample images below. The Leica DG Summilux is designed with one extra-low dispersion and two ultra-extra-low dispersion elements so it handles aberrations quite well. If you have extreme high contrast areas in your image, you will likely see some fringing, but this is easily fixed in post. Overall contrast on this lens is excellent. Its very consistent with the other lenses in the Panasonic/Leica collaboration. Flare is handled quite nicely in the DG Summilux 12mm. As previously mentioned the ED and UED elements are designed to point light sources to the edges of the frame so you maintain good overall contrast in direct light. When you shoot wide-open at f/1.4 there is a slight vignetting. Sometimes this works with certain subjects, but the lens cleans up really nicely at f/2. I mentioned that f/2.8 is really the sweet spot for this lens. At f/2.8 contrast and sharpness are at their peak – I tend to use the lens entirely in the f/2.8 to f/4 range unless I want the vignetting. At f/8 performance starts to go down and by f/16 you can see you will see lens diffraction problems. There is no need to stop down that far with this lens. Out of focus rendering is outstanding on this lens, as long as you have the separation from your subject and the background (IE you need to get up close). It looks great wide open and I would argue the vignetting is quite interesting in the right application. But you’re still going to need a full frame or medium format sensor if you want depth of field at longer distances. This is one of the issues with Micro 4/3. It looks beautiful on this lens, you just need to know how to get it to work for you. Getting super close might not be the best option for portraits. Being a 12mm true focal length you can expect distortion, but there is a lot of processing that goes on inside the camera that you may or may not have access to depending on what you use as a photo editor. I will say in Lightroom, Capture One and even Final Cut Pro (for video) – its fine. It tends to be under-corrected a little so you can adjust to taste at least. This lens performs better than the Panasonic Leica 12-60 at 12mm. You’ll see a little distortion if you’re not perfectly level but this cleans up better than most 24-25mm full frame lenses. Keep your subjects near the center of the frame or back up a little bit to minimize the effect. If you have a YouTube channel or film yourself for any social media video. This is the lens to own. Just get it – I’ve found nothing better. Autofocus is decent considering Micro 4/3 is far behind other systems in terms of being able to lock in tight enough for action stills and video. It features an internal focus drive system with a stepping motor so its quiet, compact and fast. For continuous AF in situations with burst shooting or video, I have noticed your milage may vary depending on what camera you are pairing this with. Its not a fault of the lens though. It is expensive, but I feel fairly confident its future compatible as Micro 4/3 continues to evolve. This is one of my desert island lenses and it belongs in any serious photographers collection. Though rarely a problem since this is so wide, there is no internal stabilization. Panasonic and Olympus have both designed a variety of cameras that have in-body image stabilization at least so its only an issue if your camera doesn’t have it. If you’re shooting video, you’ll want a gimbal anyway. For stills, shutter speeds above 1/25 should be just fine. I’m pretty sure it was left off of this lens to save on cost and size. Being a wide-angle it doesn’t need image stabilization like longer focal lengths typically do. This lens is sharp. It also has a wonderful bokeh when you focus on subjects close to the lens – in fact its gorgeous. This has become my go-to lens when I’m filming video on Micro 4/3 and its also one of my favorite wide angle for the system when shooting stills. Its not cheap, but its highly recommended. An essential lens if you have a Micro 4/3 system. One of my favorite combinations is to pair this up with my Panasonic GX850 which is basically an interchangeable lens point and shoot. It stays small enough and you get incredible optics for a small, vacation rig. Put it on a Panasonic GH5 and you get some of the best results for a wide angle lens that this camera is capable of. I’ve also had the chance to use it on the Panasonic G9 – if you’re primarily a stills photographer you have to give this camera a serious look. ← Panasonic Leica DG Nocticron 42.5mm f/1.2 ASPH. POWER O.I.S.